I think we can all agree that the first guys promoted from Rochester to attempt to help the Twins bullpen early this season did not perform well in their first outings. So, who else is in Rochester? Let’s get to know the rest of the Red Wings bullpen. The Twins wanted to call up Zack Littell last weekend but because the season was not yet ten days old, they were unable to. Instead, they put Chase De Jong back on the 40-man roster and Designed Tyler Austin for Assignment. 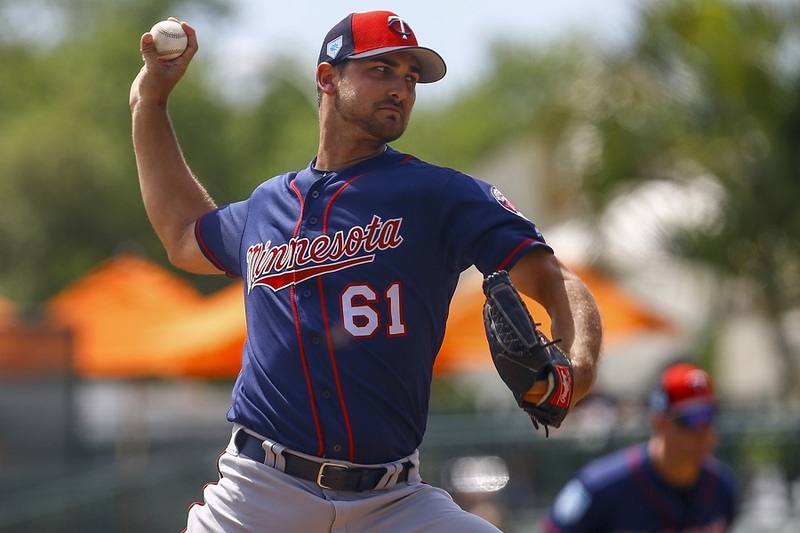 At the time, the Twins needed someone available in the bullpen who could eat some innings after Jake Odorizzi didn’t get out of the first inningFriday night. De Jong was not needed after all in Philadelphia thanks to good starts by Michael Pineda and Jose Berrios. He got his first opportunity on Tuesday night against the Mets. He came in to finish the ninth inning with the Twins leading 14-4. He needed 46 pitches to finish the ninth and gave up four runs and six base runners. I'll agree he was not so great last night. But he's had 5 other appearances and has been perfect. So you're willing to just give up on Hildy because of one bad outing? That's just so shortsighted, man. This isn't the first time Odorizzi had a lights out game but everything fell apart in an epic fashion. Most of us complained that the previous d00d didn't know when to pull pitchers ... but I think even he would have pulled people sooner than this. Baldell might be trying to be too nice. I suspect this will change after a few more games like this. Reach out to Bud Norris & Jim Johnson. Both still unsigned and both have the ability to close if needed. The Nationals deal with Norris fell through because they feel he's at least a month away from contributing. I'd pass on Johnson, he can't strike anyone out. MLBtraderumors is saying Bud Norris' deal with the Nats fell through. Jake. Reed. He's not the end-all-be-all answer, but he deserves a freakin' shot. Going on 5 years from AA & AAA with solid numbers and no MLB opportunity is sickening. 1. You wrote: "The Twins wanted to call up Zack Littell last weekend but because the season was not yet ten days old, they were unable to." Might I ask why? Is it an IL thing? Agreed. Not solid. Let's face it. Hildenberger started out hot, hitters saw him a few times, and he cooled off. Since then, he's been a decent reliever who can be a back end bullpen guy. He tends to let inherited runners score and he's not a guy we can regularly put in late inning crucial situations. He's more of a depth guy - the number 5, 6 or 7 BP guy in a 7 or 8 man bullpen. He's fine to keep (especially considering our other options) but he can't be one of the the top 4-5 guys to carry this bullpen, at least not now. A fireman who goes to the scene then wets his pants is not the answer but it does mean his intentions were good. Duffy can help throw batting practice. He grooves them in there nice and steady. Tomorrow's game already PPD apparently. Hildenberger has inherited 11 runners already this season. That’s almost half the total number of inherited runners for the entire team (25). Yesterday was the first time ANY of them scored. Hildenberger had a bad game, period. It happens. Just don’t make inaccurate statements that make him out to be worse than he is. He was very good with inherited runners in 2017, not so much last year. Overall, his career mark is 36% scoring. By way of comparison, Addison Reed has allowed 41% of inherited runners to score. Bottom line: Hildenberger is absolutely one of the key guys in the pen this year. Why would they option Hildenberger at this point in time? Or outright Vasquez? Why wouldn't you keep the guy who hasn't allowed a run yet and just send Vasquez back down while calling Romero up if that's who you'd prefer to have? Hildenberger did allow runs last night... 3/3 inherited runners scored. They had not scored until he was on the mound. Just because it doesn't count on his ERA doesn't mean he hasn't allowed a run! He allowed 3 last night. I'm not saying to option him. Not at all. Inherited runs count, none the less. It's April 11.It's cold.Pitching a baseball is not easy...especially for anyone who didn't grow up in cold weather.Anyone wanting to get rid of any pitchers this early, doesn't know squat about pitching or cold weather or anything else that I care about. 2. "Following the game, he (DeYong)was returned to Rochester since he would be unable to pitch for the Twins for several days. Is this because he threw 46 pitches? 3. I know you are being thorough, but Adams 6.49 ERA, Duffy at 4.56, Guilmet at 9.27 doesn't instill confidence. Seth, do think any of these could actually add value to the Twins? 4. I'd love to hear your opinion on Magill and / or Reed. Are they an improvement? Finally, when the populous of earth decides to make me Emperor, I'll make you head of the Twins. What would you recommend about pitching? 1.) As Doogie reported, Littell was the one that they initially wanted to call up. However because the season was less than ten days (it was nine) old, you can't call up an optioned player within 10 days unless there is an injury. That is me guessing, of course, but it's all I can come up with for the change of mind and needed DFAing of Austin. 2.) Correct. DeJong wouldn't have been able to pitch on Wednesday night... It'll be interesting to see when Rochester has him start next. 3.) I was just showing who is in Rochester as those could be the next guys called up. The ERAs hardly matter because the innings pitched are generally so small. Guilmet and Adams are over 30. Adams signed out of an indy league. But he is throwing 94-96 now. Maybe he's figured something out. I think you would take them calling up those guys as exactly what it is. Duffey, he's struggled and last year was rough, but he does have some stuff. In my opinion, with relievers from year to year (MLB signings or MiLB signings),, you never know. 4.) Magill doesn't have the ERA/WHIP/FIP stuff that you'd like to see, but I love his arm. I'm fine with giving him opportunities. Addison Reed? I mean ,when healthy, he's terrific. One of the most consistent relievers in baseball when he was healthy. Last year was the first year he wasn't healthy. He was good early last year too before the injury. I think Norris signed with someone this week. I see that the Norris deal fell threw... That'll teach meto respond without looking ahead. (1) Make Odorizzi the BP arm and bring up Kohl Stewart or Romero to start. Overpaid as a long man, but really seems to fit his talent level/profile. Really good as your 6th starter and could be a trade chip at the deadline for a team desperate for starting pitching.Stewart did well last year, admittedly against September lineups, same for Romero in the front of the year.I think both represent viable options now as a starter. Gonsalves and Thorpe are not ready to start in the bigs yet and I think Little is only an eventual no.6/7 starter/BP arm IMHO. (2) Make Perez a BP guy all season. He doesn't look like a starter. Looks more like a 1 inning maybe 2 inning reliever, which is what Texas was going to do with him.He's in the Bullpen, leave him there. I say do this regardless of whether you do No. 1 except then you have to start 2 of Stewart, Romero and Littel. (3) Leave things as is and call up Mike Morin or Ryan Eades. Morin was a so-so reliever for the Angels until getting hurt and could add depth. Eades looked good in ST, decent in the Minors the last 2 years. Same depth kind of guy. I'd start with Morin. Whatever we do, send Vasquez back down. Can;t keep him here after that performance. He looked scared and simply not ready. The rest of the roster won't trust him and I think it would be bad for his development to go out and pitch badly a second time. Tell him you still have faith in him but that he needs more time and he'll be back up this year if he does will in AAA. Send him to Rochester and replace him with one of the guys mentioned above.Whatever we do, let's not keep him up and take the risk of watching him implode again.Bad for him, bad for the team's morale, and not a risk worth taking IMHO. Odorizzi interests me as a bullpen guy as well.It seems like his stuff could play up if he wasn't trying to hold back and it would certainly minimize his weakness of getting out of the 5th. There isn't enough depth at SP to do it though.Maybe if Gonzalvez wasn't hurt or they hadn't messed with Romero, even then its thin. Need to stretch some guys out at Rochester. And also see what do have. Worried that Odorizzi would be a five inning pitcher. Hopefully Pineda goes deeper. Not sure about the greatness of Perez. I would almost start Mejia at this point, but sure Perez will be the first option. There are at least placesetter arms. But, why or why did you throw a rookie into a bases loaded situation? What might've happened if you ahd used Taylor Rogers for that one batter? 1) That game last night was not only frustrating but downright embarrassing! Did Rocco out think/manage himself? I absolutely think he did. But really, score was 2-1 or 3-1...its all a blur at this point...and we couldn't get ONE MORE OUT? At some point, it's on the pitchers. I'm concerned to be sure, and we all know we need better. But 10 games in? Im not getting out whips or pitchforks for anyone. 2] Barring a trade, the improvement must come from the IL and Romero. Reed deserves a shot, but do you feel good about anyone else there? I sure don't! Could a SP help? Yes, even though I'd rather keep them starting. 3] Odorizzi is not a bad arm or a bad pitcher. What he is is a quality 5th SP who has flashed better at times, especially at the tail end of the past 2 seasons. But right now he's our 4th SP and that's the problem. (And my opinion as I believed before the season began a healthy Pineda would be our #3). While there is potential at Rochester, today, there is nobody ready to replace Perez, much less Odorizzi. He should be our #5 SP or in the pen, where his SO ability plays, and where he can pitch multiple innings if necessary. Just not going to happen anytime soon. After one start this year there was actually a post about Garver receiving so many negative tweets that he was going to avoid twitter. Just a couple games later he is a hero. May and Berrios and countless others have been written off at one point by fans. Of course there are others who have done just fine right out of the gate. Rosario on his first pitch comes to mind. Maybe breaking into the league by inches is desirable for some but not for everyone. These are presumably elite and confident athletes and this is the 2018 minor league pitcher of the year for Pete's sake. He has like a 1.5 ERA in his career. There is good reason to think there is at least a 70% chance he would get his guy out and only a 1% chance that he won't get an out or a ball in play. He's a professional reliever with a good track record so lets lay a little of the blame at his feet for simply not getting the job done. He's also a professional reliever with a good track record so lets not be so quick to assume he is not a good answer going forward. Vasquez has all of 5 career innings, so not only does he not have a good track record, he doesn't have a track record. Is there a way to force a free agent to take way less money and years than they are demanding? If not, then no, they shouldn't have signed him. Signing him to those terms would have been awful. I think that's a little cherry picking of the stats. Last year, Hildenberger was the worst full time reliever on the team in terms of inherited runners scoring at 56%. In other words, more than half of the runners he inherited last year scored.Addison Reed was at 20%, Rogers 23%, Moya 33.3%, Pressley 34%, Magill 39%, Rodney 10%, and Busenitz 50% . He was the worst full time reliever we had last year in stranding inherited runners,and by a pretty significant margin. He was ahead of only Ryan LaMarre and Aaron Slegers who each went 1 game in relief.He was better in 2017. Was last the result of him being figured out or of over use? I say its a little of both but mostly the former; sounds like you think the latter. I think we are in trouble if Hildenberger has to be a "key guy" in the bullpen. If your point isn't that he is an above average reliever who can perform as a key guy but that he may need to be a key guy as the bullpen is presently constituted, you may be right but I don't see that as a good thing. To me, that just points out our lack of depth. Even if we use career stats over the most recent performance shown in the the stats last year, he's basically a little below average at stranding runners. Add to that a career 4.47 ERA and 3.90 FIP over 116 games, including the games this year, and 1.256 WHIP and you have an averageish to below averageish MLB reliever.That doesn't strike me as a guy we can rely upon as a key guy; that strikes me as an depth guy. He has 6 K's and 1 BB in 3 2/3 innings. You are right, that's not solid, it's excellent. I think that's a little cherry picking of the stats. Last year, Hildenberger was the worst full time reliever on the team in terms of inherited runners scoring at 50%. Addison Reed was at 20%, Rogers 23%, Moya 33.3%, Pressley 34%, Magill 39%, Rodney 10%. He was the worst full time reliever we had last year in stranding inherited runners,and by a pretty significant margin. He was ahead of only Ryan LaMarre and Aaron Slegers who each went 1 game in relief. He was better in 2017. Was last the result of him being figured out or of over use? I say its a little of both but mostly the former; sounds like you think the latter. I think we are in trouble if Hildenberger has to be a "key guy" in the bullpen. If your point isn't that he is an above average reliever who can perform as a key guy but that he may need to be a key guy as the bullpen is presently constituted, you may be right but I don't see that as a good thing. To me, that just points out our lack of depth. Even if we use career stats over the most recent performance shown in the the stats last year, he's basically a little below average at stranding runners. Add to that a career 4.47 ERA and 3.90 FIP over 116 games, including the games this year, and 1.256 WHIP and you have an averageish MLB reliever. That doesn't strike me as a guy we can rely upon as a key guy; that strikes me as an depth guy. How is stating his CAREER IR/IS percentage cherry picking? Basing a decision solely on last year would be cherry picking IMO. I'd rather have Keuchel than a RP.....but then, I'm looking at next year's SP, not just this year's......One good SP under contract past this year. One.